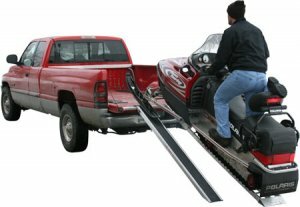 Premium snowmobile ramps are the most versatile and complete loading ramp available and make load a snowmobile into a pickup truck or on a trailer a breeze. Designed with integrated graphite ski guides accommodate single, double or even triple carbide skis. 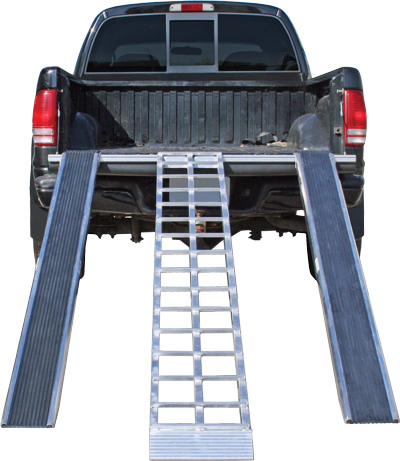 Our premium snowmobile ramps are the most versatile and complete loading ramp available and make loading a snowmobile into a pickup truck or on a trailer a breeze. Integrated graphite ski guides accommodate single, double or even triple carbide skis. The center ramp features 1/2″ square cross bar cleats for maximum traction in all weather conditions and a huge 1,250 lb capacity to load even the heaviest of sleds safely. Both the center and side ramps feature a hybrid hook / plate end for strength and versatility, tapering at the bottom for a smooth entry and exit. These all aluminum ramps will never rust and can be stacked neatly for storage in your truck bed or on your trailer. Center ramps are also available separately for loading Motorcycles, ATVs / UTVs or lawn and garden equipment.